Western Art, also called Cowboy Art, flourished during the 19th century. 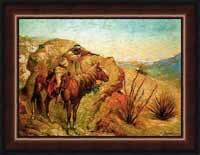 Artists painting in this style created a mythic image of the American West that continues to inspire us today. Western Art represents cowboys, bronco busters and braves, the loneliness and magnificence of the American West. Western Art developed in a time when the romance of "wide open spaces" called many to try life on the new American frontier. It was a time when individual heroism was possible and life in the American West was charged with adventure. Many viewers in the East and Europe believed that Western artists exaggerated the beauty of the landscape, so stunning were their portrayals of the Rocky Mountains, the prairies, rivers and Pacific coast. Western artists tried to convey in their canvases the sweeping vistas, heroic figures, and moments of danger and conflict that came to define the romance of the West. Western Art continues to inspire both artists and art lovers today. Many favorite contemporary artists paint and photograph Western and Native American scenes. Native American art is experiencing a rebirth in interest and accomplishment today, with many young and talented artists taking up the art form. Native American art appeals to viewers today because it illustrates sacred connection between humans and the Earth. 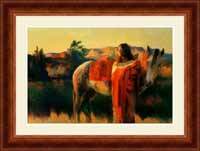 View our entire collection of Western Art. 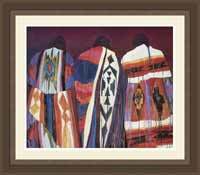 Click here to visit our Native American art collection. 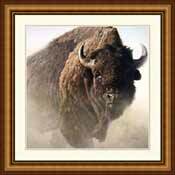 Click here to visit our Cowboy Art collection.